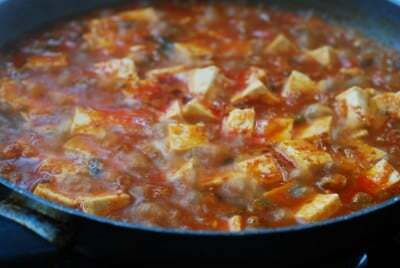 Mapo tofu is a popular Chinese dish in which small tofu cubes are braised in a spicy chili bean paste-based sauce. It originated from the Sichuan province that’s known to have cuisine with bold flavors — pungency and spiciness. Mapo tofu is also a popular menu item at Chinese restaurants in Korea. It’s called mapa dubu (마파 두부) in Korean. Mapo tofu recipes typically call for doubanjiang (dubanjang, 두반장, in Korean), which is a spicy, salty fermented bean paste and Sichuan peppercorns (aka Chinese coriander), but these ingredients are not staples in Korean kitchens. 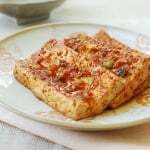 So, to recreate this dish at home, Koreans often use a combination of Korean fermented soybean paste (doenjang), red chili pepper flakes (gochugaru), and red chili pepper paste (gochujang). It works deliciously! 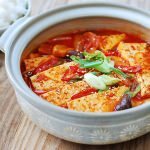 It certainly is not the dish you get from your local Sichuan restaurant, but it has all the elements of the dish – soft tofu infused with intense savory and spicy flavors! Start the cooking by stir-frying the aromatic vegetables and some gochugaru in hot oil. 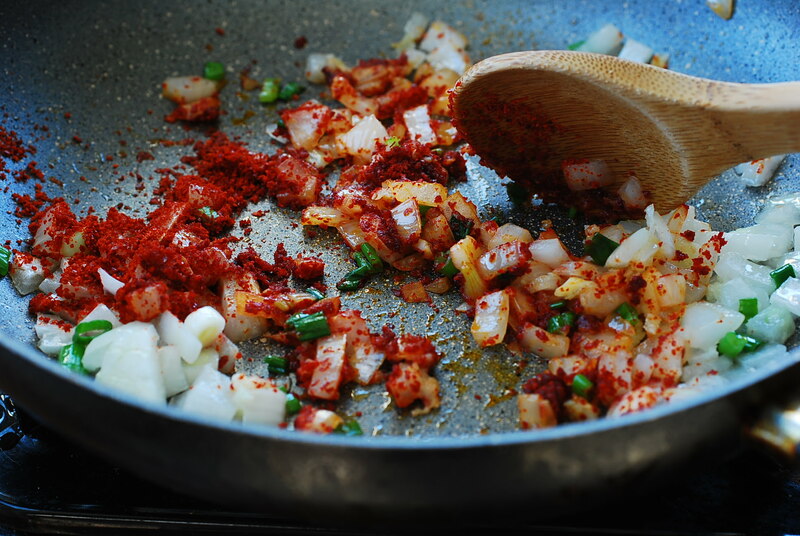 By adding the gochugaru at this stage, you’ll create the effect of using chili oil. You can still use chili oil, if available. To give the sauce more heat, you can add some dried hot peppers to the oil, use more gochugaru, or throw in some fresh hot chili peppers instead of the bell peppers I used in this recipe. 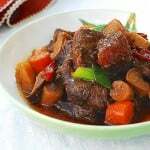 Pork is the classic meat for this dish, but you can use beef if you’d like, or omit the meat to make a vegetarian dish. 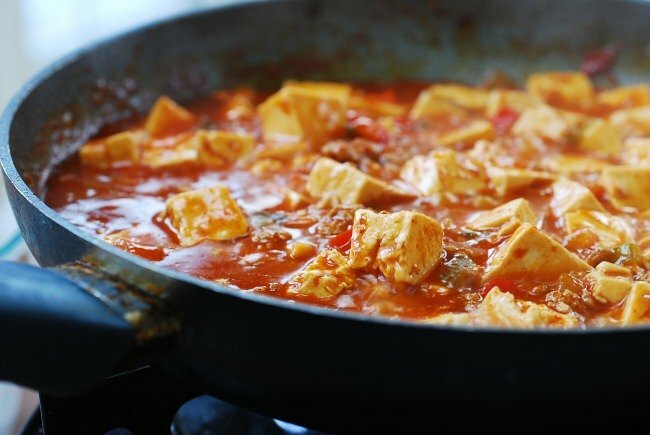 I prefer to use soft tofu, (not extra soft/silken) which is labeled as 찌게용 (for jjigae) if you buy Korean tofu packages, but the firm one, 부침용 (for pan frying) is okay too if you’d like a firmer texture. 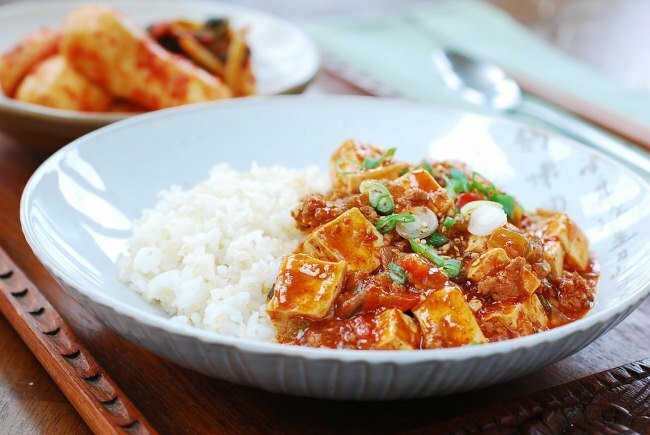 If you like Korean flavors and tofu, you will love this dish! I bet you can whip this up in less than 30 minutes, making it suitable for a weeknight meal. Prepare the vegetables as specified. 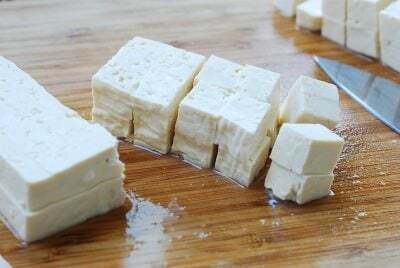 Cut the tofu into about 1/2 to 3/4-inch thick cubes. 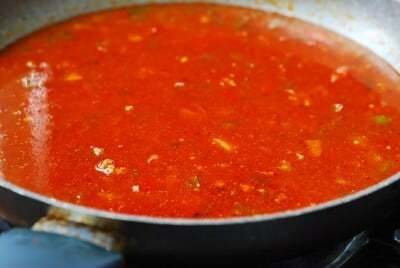 Heat a large pan with 2 tablespoons of oil over medium high heat. Add the onion, 1/2 of the chopped scallion, garlic, and gochugaru, and stir-fry until fragrant, 2 - 3 minutes. 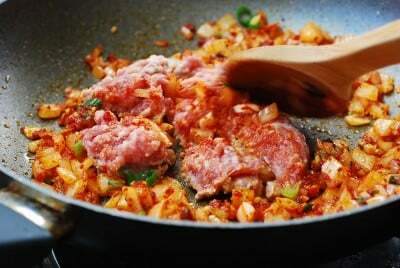 Add the meat, and cook until the meat is no longer pink, breaking up with a wooden spoon, 2 to 3 minutes. Add the soy sauce, doenjang, gochujang, and sugar and stir to blend with the meat. 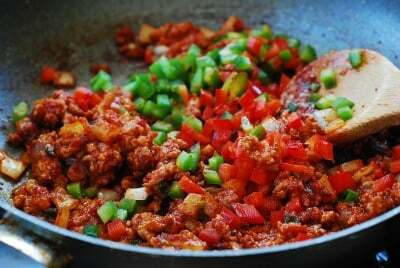 Add the bell peppers and cook briefly until slightly softened. Add 1-1/2 cups of water to the pan, and bring it to a boil. Then, slide the tofu into the pan, gently stirring to spread into a single layer. Cook for 5 to 6 minutes, gently stirring 2 to 3 times to make sure the tofu doesn’t stick to the pan. Gently stir in the starch slurry to thicken the sauce, and then the sesame oil. Cook for another minute or so to bring everything together. 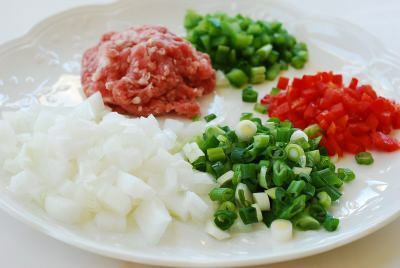 Garnish with the remaining scallion, and serve hot with steamed rice. Just made this and It’s so good! The beautiful picture caught my eye immediately. 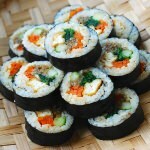 I’m already a big fan of your website for its well-balanced, healthy and easy to follow Korean recipes. Thank you so much for sharing all those amazing recipes with us. I am happy to hear you liked it! Thanks for trying the recipe and for being a big fan! Delicious 🙂 Thank you for the recipe! I made a vegetarian version of this for dinner last night and it was delicious. I had Pulmuone brand silken tofu in the tub (not the tube) and it worked well. I would have run out to buy soft tofu if we weren’t snowed-in but I am glad I tried it with what I had on hand. The custardy cubes kept their shape and contrasted well with other chewy bits in the sauce. In place of the meat, I crumbled up defrosted and squeezed out tofu and added a little mushroom powder to make up for any lost flavor. Great, Latha! Sometimes we have to work with what we got, and you seem to know how to do that well. What a nice idea to add mushroom powder! Thanks for trying the recipe and giving me and the readers feedback! It really helps. 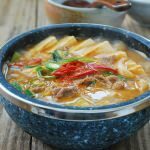 How can I do non-spicy version for my kids?? Do I just sub soy sauce for gochujang?? Omit gochugaru, which is the main source of spiciness. You won’t need soy sauce for that. If they can take a little heat, you can leave gochujang in. 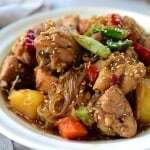 If gochujang has to be omitted too, you can use a little more soy sauce or doenjang. Hope this helps. If I don’t want to put soy bean paste in, can I put in more gochujang instead? You can, but it will taste different from the recipe. I am sure it will still be good. Let me know how it turns out. I made this tonight it was great! Thanks! So nice to hear that! And thanks for the vegan meat substitute idea. I’m sure it’s very helpful to my vegan readers. I am actually living in China, so I can get mabo/mala doufu just about anywhere, but I really miss my dad’s style mapodubu. Which is basically the Chinese Mapo Tofu Sauce packets from House Foods. You know, the kind where all you have to do is add the tofu and ground meat. 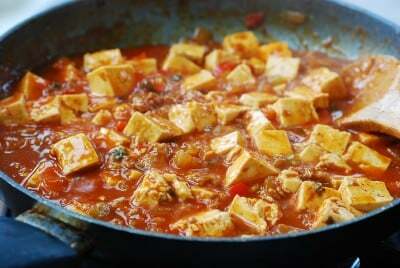 Would you say your recipe is very similar to the taste of the House Food mapo tofu? 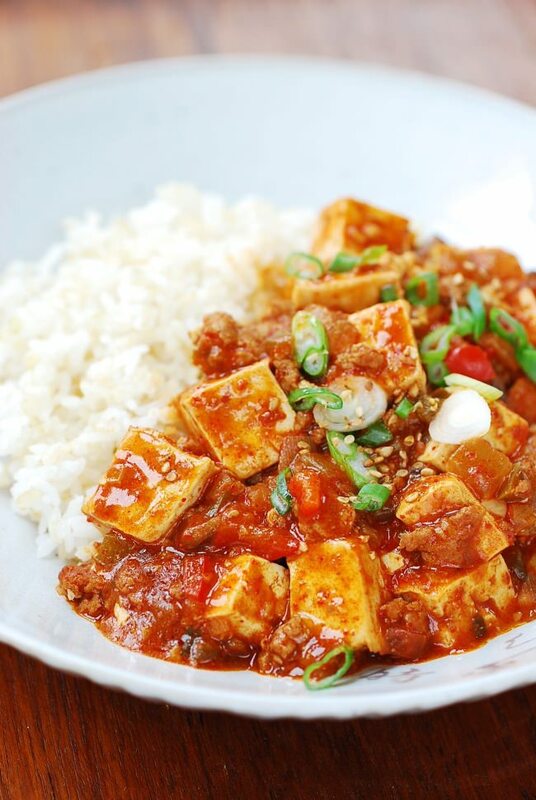 We made your mapo tofu but veganized it by subbing the meat with mushrooms. We also served it on top of zucchini bites to make it small appetizers! It was absolutely delicious! Thank you so much for the recipe! It was easy and absolutely delicious! Hello! 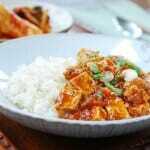 I’ve tried out two of your recipes this week and Mapo Tofu is next on the list. Can you explain what starch slurry in step 8 is? What are the banchan that goes well with this dish? any vegetable side dishes will be great! Preferably not spicy to balance the spiciness of this dish. 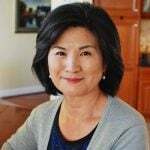 I found this site and was happy to read all of your story’s along with your recipes. I love Korean Food been eating it for twenty or more years in NYC. Never cooked Korean at home because I had great restaurant to eat and choose from. Now I am in Florida in the PanHandle area. I love kalbi tang and a cold kimchi soup that the restaurant serves summertime in NYC. Would you be so kind to give me a recipe for this delicious delectable cold soup. 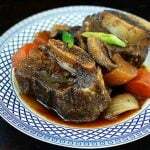 I love your site wish I wad near you to teach me all the cooking style of your great foods I so love. Thank you so much for sharing you foods. Used the same measurements of gochujang to donejang but mine was definitely not as beautifully red in color..still delish nevertheless! So delicious!! Thanks for the delicious recipe! !